The LL4 Progressive Cavity Pump is for highly abrasive and wearing applications such as grouting and slurry mixtures with a high abrasives content of up to 50% in suspension. The Liberty LL4 parts are direct-fitting aftermarket replacements that interchange with the *Moyno® L4, *Tarby® TL4 and *Continental® CL4 models. 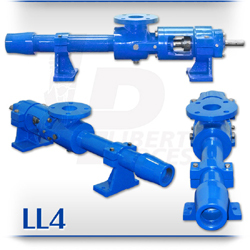 The LL4 is a standard flanged pump design manufactured with cast iron or 316 stainless steel casings and designed in 1, 2, and 3 stages for 75, 150, and 225 psi discharge pressures pumping from 0-24 GPM. (2.02 Gallons per 100 revolutions). The LL4’s comes with a hardened pinned joint-drive assembly that ensures increased durability during rough pumping applications. The LL4 Rotors are typically tool steel or 316 stainless steel with a hard chrome plating, ideal for thickened grout an grouting slurries. All other wetted parts are either carbon steel or 316 stainless steel. Stators are available in many elastomer materials such as buna, natural rubber, epdm and viton depending upon application. If you do plan on using this pump for heavy slurries with solids content, be sure to talk to your Liberty representative to get the right rotor and stator for your application. The standard seal design is a set of packing rope; however, mechanical seal assembly retrofits are readily available. The LL4 Progressive Cavity Pump represents one of the most effective choices in PC pumps today for the pumping of thickened liquids with high abrasives content and liquid slurries.